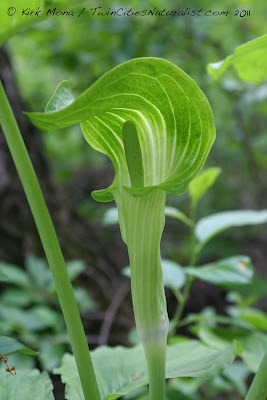 Jack in the Pulpit is up. Get out there and find some. They are easy to miss because the flower hides under the large leaves. Familiarize yourself with the leaves, not the flower. That should help. They should be all over the Twin Cities though places with fewer deer and should have more. I don't know any specific places to recommend, these were on private land. I would imagine they would be at Fort Snelling State Park and probably even some of the wilder portions of Minneapolis parks.